Today visit the most important and enchanting city of colonial Guatemala. Founded by the Spaniards in 1543, nowadays Antigua is a beautiful blend of ruins, restored colonial buildings, and new buildings in colonial style. 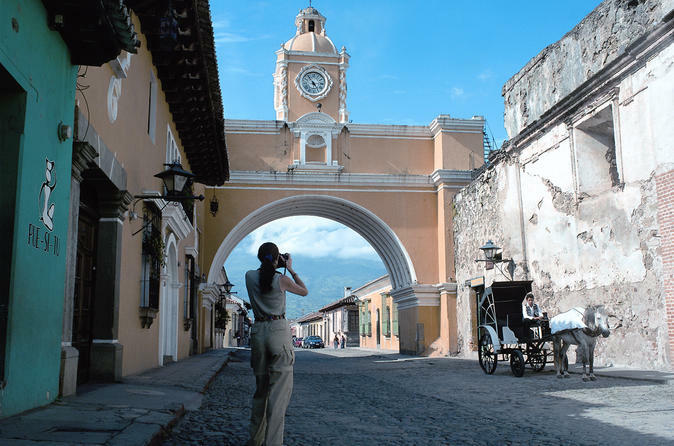 At 14:00 Hrs., you will be picked up at your Hotel for transfer to Antigua Guatemala, the most important and enchanting city of colonial Guatemala. Founded by the Spaniards in 1543, nowadays Antigua is a beautiful blend of ruins, restored colonial buildings, and new buildings in colonial style. It was declared “Monument of America” in 1965. Visit the Central Plaza, that is surrounded by the antique Cathedral, the Municipal Government Building, and the Palace of the Captains General; colonial churches and monasteries, primitive foot-looms where colorful textiles are woven, and a jade factory where this stone is worked into beautiful jewelry. In the afternoon, return to Guatemala City.